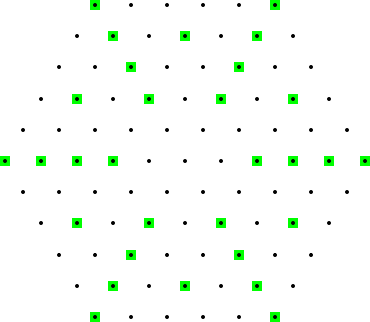 Highlighted in green are the points which are hidden from the center by a point closer to it. It can be seen that for a hexagonal orchard of order 5, 30 points are hidden from the center. Let H(n) be the number of points hidden from the center in a hexagonal orchard of order n.
H(5) = 30. H(10) = 138. H(1 000) = 1177848.